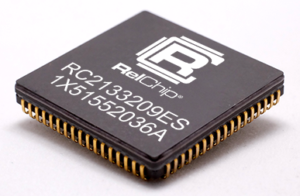 The RelChipTM RC2133209 is a 32Kx9 synchronous SRAM. 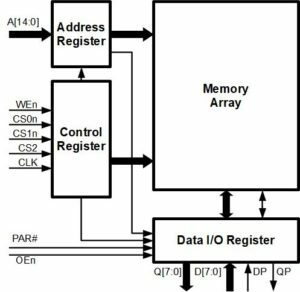 The address, data input, and data output pins are separate, although the logic supports connecting data in and out for a data multiplexed bus. The ninth data bit is configured for no connection, 9th bit of data, or parity by external pins.When a byte is written, parity bits are calculated and stored as the ninth data bit. When read, either that parity bit, or the comparison of the parity bit written and the parity of the read data is reported.